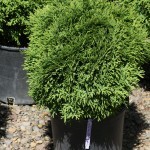 A compact shrub, tightly globe in form, with rich green foliage which holds color well in winter with minimal bronzing. Plant in full sun to some shade in an average, well-drained soil. It is useful for a low hedge, mass planting or as an accent in the landscape.